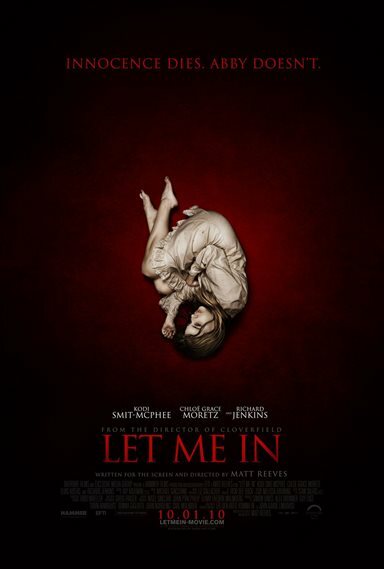 Download Let Me In in Digital HD from the iTunes store. Let Me In images are © Overture Films. All Rights Reserved. There are a lot of movies right now about vampires. So much so that it is difficult not to feel overwhelmed by all of it. So it is refreshing to find a movie that steps a little bit out of the standard vampire myth and instead gives us a commentary on relationships. Let me in was originally a Swedish movie about a young boy whose neighbor, a young girl, happens to be a vampire. It did quite well so it wasn't surprising when Hollywood jumped at the chance to make its own version. The movie opens with an ambulance rushing a burn victim to the hospital. Not long after the mysterious victim is stabilized he is found dead outside the hospital. The timeline now jumps back 2 weeks and we are introduced to Owen. Owen is a twelve-year-old boy who lives with his mother, who is getting divorced. Owen is right at that age where a boy is awakening into sexuality. We also see a side to Owen not common to most boys. He is brutally tormented by three boys in his class and like most boys, Owen dreams of the chance to stand up to them. One night he witnesses the arrival some new tenants where Owen and his mother live. A night or two later and Owen meets Abby, a girl of his age who has a penchant for walking barefoot and only coming out at night. One night Abby's "father" step out for a bit and kills a teenager. He hangs him upside down and then drains his blood into a large water container. Unfortunately Abby's so called dad has a small accident and loses all the blood, so now she is forced to fend for herself until he came come up more. If you think about it though they are two sides of the same coin. She kills to live and he kills to keep her safe. They are trapped and bound to each other no matter what they do. As time passes Owen and Abby get to know each other and even though Abby is reluctant at first she begins to like Owen. When Owen asks her to "go steady" she naturally hesitates because she can't actually any kind of real relationship, but she still does so because if she doesn't she faces a world on her own. Abby's father eventually screws up big time and we realize it was him we saw in the hospital at the beginning of the movie. So now Abby has only Owen and of course she slowly begins to rely on him more and more. As the movie reaches its climax we see that deep down even though Abby may be a very old vampire, she really has no idea how to live on her own. She relies completely on others to help her survive. Even when she attempts to strike out on her own, she returns to "save" Owen and draws him into her world. Though Let Me In looks like your basic vampire movie, it actually speaks to the destructive nature of co-dependent relationships. Owen is so desperately alone that even someone as destructive as Abby can seem like an angel from Heaven. When Abby loses her surrogate father, she turns to Owen for help and though she may not have bad intentions, she forces him to feel ingratiated to her. While it is always fun to see a vampire movie where they are either the most suave and dangerous person you have ever seen, it is refreshing to see one where you realize that this age old myth really speaks to our own lives in ways we rarely realize.